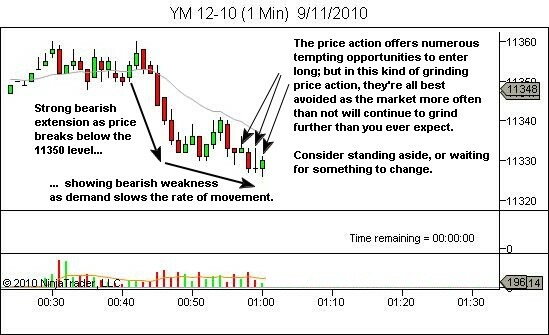 Entry to a counter-trend trade can be difficult to time, especially when it’s not in the vicinity of any significant S/R level. And particularly when it just keeps grinding a little further, then a little further again; always offering what appears to be tempting entries. It’s probably wise advice for newer traders to just pass on these sort of trades. 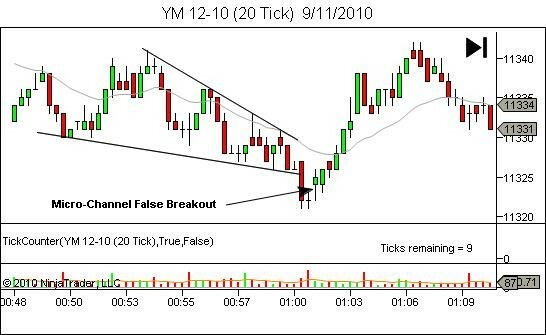 Stick to the with-trend trades and only consider counter-trend when a great signal is provided at S/R; in particular a breakout failure. However, sometimes these grinding areas of price action do offer a signal that’s too good to pass up. 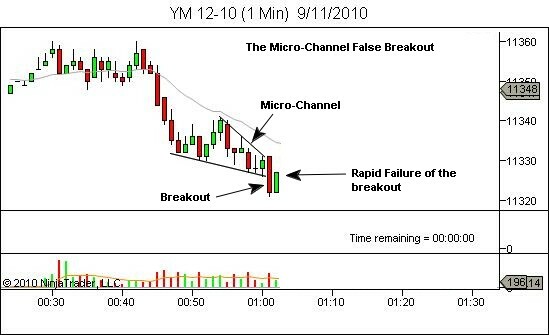 The micro-channel false-breakout is one of those. 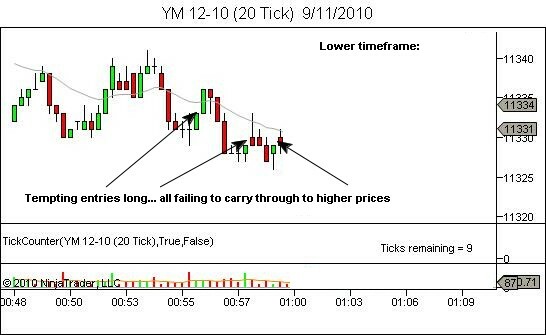 Let’s look at the trading timeframe again (below). Note the upper and lower lines defining the channel. 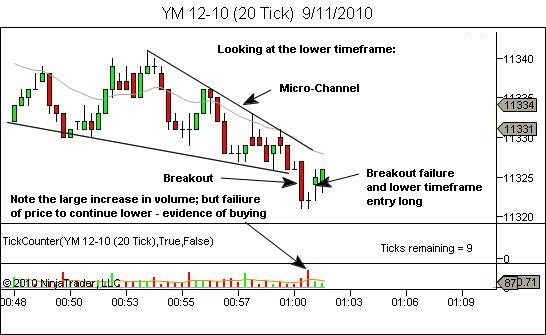 I don’t personally draw channel or trendlines on my charts – they’re there to assist with your identification of the appropriate area. And with experience you’ll see them without having to draw lines. And also it doesn’t matter if the lines are parallel, converging or diverging. The important point here is that we’re looking for something to change… the grinding crawl lower to suddenly offer some price action which surprises traders. In this case, price suddenly surges lower, which will attract new shorts and stop out some of the weaker longs. However it then fails to continue; failing to attract a wider bearish following. Price rallies, trapping the new shorts in a losing position. 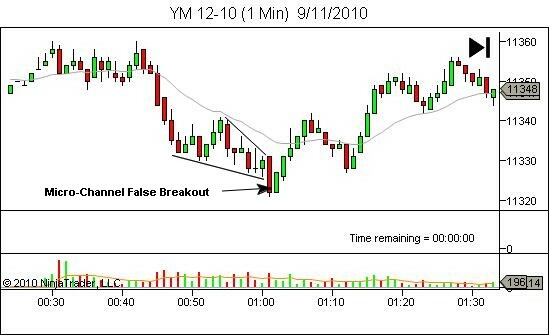 Note the difference between any earlier attempts at a long entry, and this micro-channel false-breakout entry, from the perspective of the other traders. The micro-channel breakout causes high emotion… new shorts enter the market with some excitement… before the market turns around and smashes them. This is a high emotion event. Far greater than any emotion associated with earlier entries. For YTC PAT readers, you’ll know that a weakening trend counter-trend entry such as this does not automatically lead us to expect a reversal. Trades such as this should be taken in expectation of a short move only. Our expectation is then for a complex pullback and continuation lower, unless evidence is shown of strength against the trend and acceptance of trend-change. Of course, the trend change did occur in this case… so review the above charts to see how you would trade the action following the micro-channel breakout failure. In particular, where you see the changes of strength / weakness; and where you identify the change of trend. There’s no right or wrong answer… just learning.